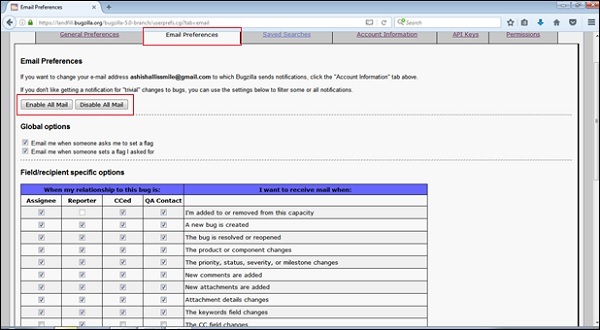 The Email Preferences feature in Bugzilla allows to enable or disable email notifications on specific events. In general, the users have almost complete control over how many emails Bugzilla sends them. 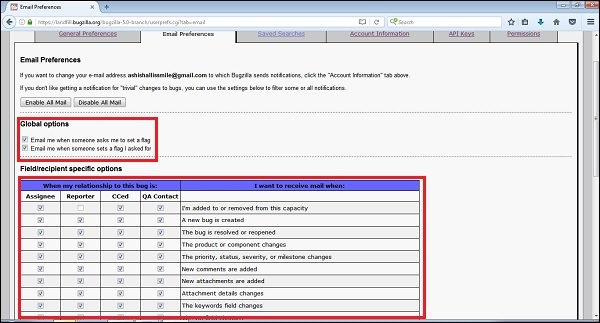 If the users want to receive the maximum number of emails possible, click on the Enable All Mailbutton. If the user does not want to receive any email from Bugzilla at all, click on the Disable All Mail button. To navigate, go to Preferences/User Preferences option on the home screen and click on the Email Preferences tab. Email me when someone sets a flag I asked for. These define how a user wants to receive the bug emails concerning the flags. Their use is quite straightforward: enable the checkboxes, if the user wants Bugzilla to send a mail under either of the above conditions. Bugzilla has a feature called as User Watching. When the user enters one or more comma delineated other user accounts (usually email addresses) into the text entry box, the user will receive a copy of all the bug emails those other users are sent. This powerful functionality is very important and useful in case if the developers change projects or users go on a holiday. User can mention a list of bugs from those never wants to get any email notification of any kind. For this, user needs to add Bug ID(s) as a comma-separated list. User can remove a bug from the current ignored list at any time and it will re-enable email notifications for the bug. After selections are made, click on the Submit Changes button at the bottom left hand side of the page. 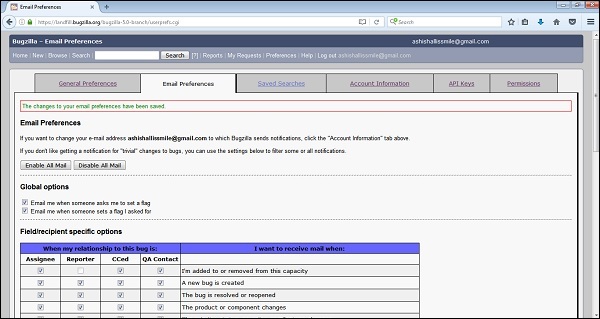 A successful message will display as “The changes to your email preferences have been saved” as shown in the screenshot below.